Fundamentally, computers just deal with numbers. They store letters and other characters by assigning a number for each one. There are hundreds of different encoding systems for mapping characters to numbers, but Unicode promises a single mapping. Unicode enables a single software product or website to be targeted across multiple platforms, languages and countries without re-engineering. It's no wonder that industry giants like Apple, Hewlett-Packard, IBM andMicrosoft have all adopted Unicode. 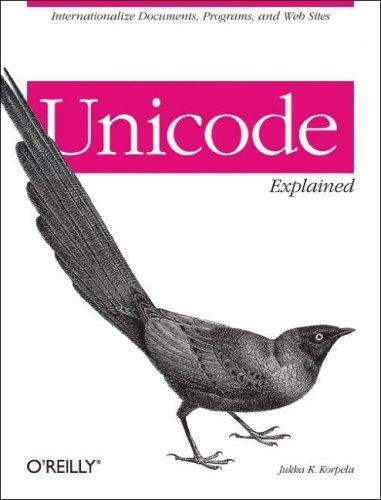 Containing everything you need to understand Unicode, this comprehensive reference from O'Reilly takes you on a detailed guide through the complex character world. For starters, it explains how to identify and classify characters - whether they're common, uncommon, or exotic. It then shows you how to type them, utilize their properties, and process character data in a robust manner.